Both our Metric and Imperial Clear PVC pipe has the same operational properties as our standard grey tube however the fittings differ. Clear fittings are only manufactured, to any degree of quality for use in industrial systems, in imperial (inch) sizes. Those that we stock are part of the Eviclear™ range which although designed primarily construction and demonstration purposes, are manufactured to US Schedule 40 specifications. 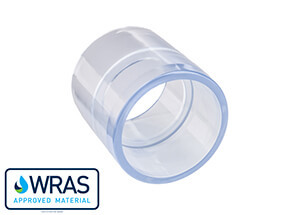 We recommend that our transparent fittings are used at maximum pressures of 5 bar. Sightglasses to inspect levels in tankers, header tanks and silos. Demonstration systems of both industrial and domestic plumbing processes where the process can be viewed. Inspection for the presence of liquid such as in drain lines, process lines & condensation traps. Inspection and evidencing of correct mixing in closed process lines. Creative pipe and tube projects for sculpture and the film and media industries. 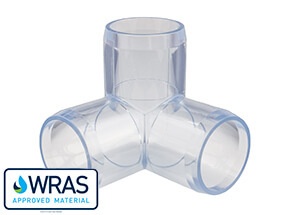 Our Eviclear range of clear PVC fittings includes 3, 4 &5 way fittings as well as slip tees and the more "usual" fittings found in plastic pipe systems. Clear PVC pipe has a manufacturers recommended operational temperature of between 0°C and 60°C (32°F and 140°F). At lower temperatures, like all PVC pipe it becomes more susceptible to breakage from impact, and at the higher range of temperatures, the plastic in the pipe becomes softer and the pressure rating is reduced. PVC clear pipe is not suitable where there is a high level of abrasion. The pipe will, over a short period of time, become marked on the inside wall and become gradually more and more opaque. Clear plastic pipe made out of PVCU is a rigid product. There is a little bend in the smaller diameter lengths but using the pipe with a set bend in it wil put stress that is not intended on the pipe and any fittings attached to it. Both our metric and imperial clear PVC pipe are manufactured from a plastic formulation that is free of any toxins that may leach into the water. This is done to enable it to be used with drinking water and meet (in the case of our Eviclear™ inch sizes of transparent pipe and fittings) WRAS Approval. It does however mean that no UV stabiliser chemicals are added to the plastic formulation so that over time (depending on the intensity of the sunlight) that the clear pvc pipe will gradually become opaque if exposed to the sun. In the UK, this process will typically take three to five years before the product cannot be seen in the pipe. All our clear PVC pipe and fittings are non toxic. The "Food Safety" of transparent PVC clear pipe is determined by the foodstuffs that it is in contact with. There is a general European standard for food safety (Eurpoean directive 2002/72/EC) which our metric clear PVC pipe conforms to, but this is a very general standard and PVC chemical compatibility charts should always be consulted prior to use. The chemical resistance profile of clear PVCU pipe is that same as for standard grey PVCU pipe and a chart can be found here. Transparent PVC pipe is a rigid product however it requires to be supported along its length to prevent it from sagging or becoming stressed. See our clear pipe support table for more specific data. Our clear PVC pipes conform to pressure pipe standards and so will not be size compatible with drainage or waste pipe systems. See Metric Clear PVC Pipe Dimension Tablesfor more size data. As the temperature of the clear pipe increases, the plastic becomes softer and so the pressure rating lowers. See Pressure Derating Table for more data and how to calculate the correct pressure rating at a specific temperature. 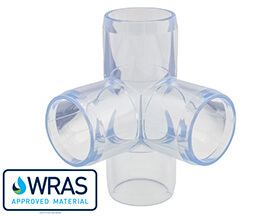 A transparent pipe that shows a clear view of the inside of the pipe only remains so if it is clean internally and externally. Whilst the latter is easy to control by washing dust and debris off, the former can be more difficult where a plastic pipe system is involved. A biological film of bacteria and/or algae can coat the inside of the pipe if the conditions are right, or, if the water contains fine particles, these can settle on the clear pipe internal wall. It is therefore recommended that clear pvc pipe is installed so that it can be removed for periodic cleaning. Using unions or flanges is the best way to achieve this. Unions and flanges are however only available in our standard grey pvc ranges, but are compatible with the clear pipe systems. 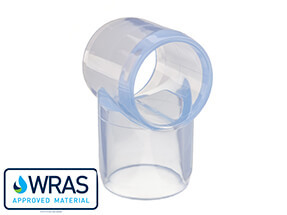 The Eviclear range of clear plastic pipe in inch sizes has WRAS approval materials status for pipe and fittings. 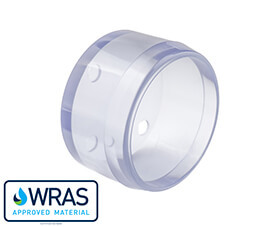 WRAS materials approval means that the clear pipe and fittings have been tested by an accredited laboratory in the UK and passed as conforming to the British Standard BS6920. This tests for leaching of any chemicals out of the clear plastic pipe or fittings, and passes them as fit for use with drinking water systems in the UK. The measurements in the table below assume that the pipe in question is carrying a liquid of similar density to water at 20°C and 40°C. 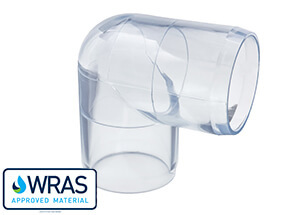 Extra clips and support should be placed either side of heavy fittings, valves or equipment and either side of clear pvc pipe elbows that are mounted horizontally. If you are unsure of the best way to support your system, give us a ring and our technical team will help you find the best solution. Like all types of plastic pipe, the pressure rating of clear PVC pipe will change with an increase in temperature. Use the table below to calculate the actual pressure rating. For example 10 bar pipe, operating at 30°C will be 10 x 0.8 = 8.0bar. Where to find or buy clear PVC pipe. We are often asked "where can I find some clear PVC pipe near me?". The best answer to this is you probably can't! There are very few stockists of clear pvc pipe and fittings in the UK, many companies show it on their websites, however, most of these do not carry their own stocks. 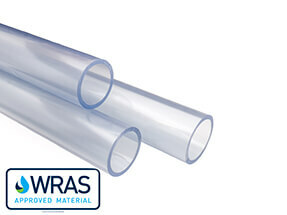 Plastic Pipe Shop Ltd are direct importers, distributors and stockists for most of the major clear PVC manufacturers. This is important as clear pipe only travels well when properly wrapped (which we are experienced in doing) and with fewer journeys. 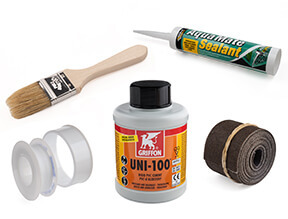 When supplied direct by us, you will find it arrives in the top condition possible. When purchased through secondary "middle man" companies the pipe may be shipped to them and then re-wrapped and sent out again. This increases the chance of marks showing on the pipe. We can ship clear pipe next day or on an a.m. (pre-noon) service, confident that you will find that it will arrive with you in the best condition possible. Our clear pipe and fittings are made by two different companies. 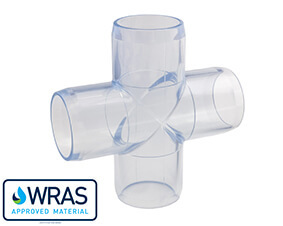 The inch sized WRAS approved clear pvc pipe and fittings are made by a company in the USA. Our metric pipe is made by a company in Germany. 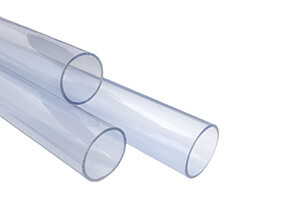 • Clear PVC pipe is available in either inch or metric sizes. • Fittings are only available in imperial (inch) pipe sizes. 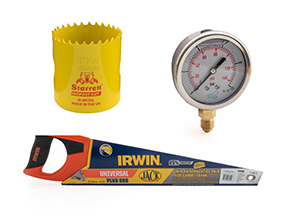 • Clear pipe pressure ratings are the same as grey pipe. 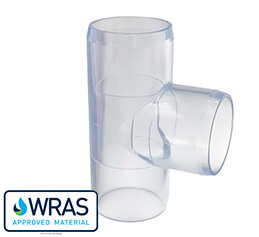 • WRAS approved clear pipe is not UV stable. • Clear pipe should be installed in a way that periodically, it can be internally cleaned.